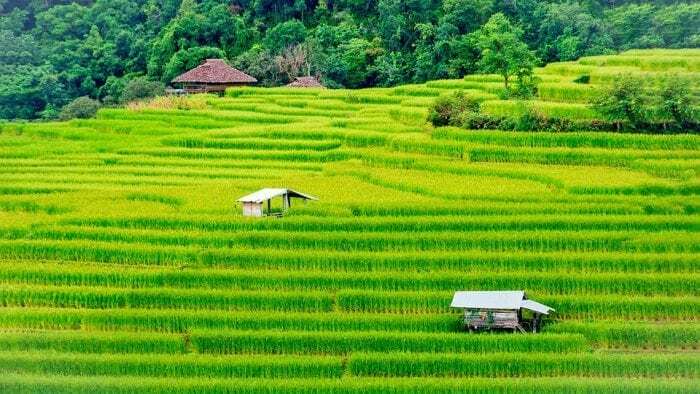 In most East and Southeast Asia countries, mosaic crop production systems usually consist of relatively small land holdings ( < 2 ha), which are managed by individual farmers/families (Fig. 1). Diverse field water and nutrient management practices exist among spatially adjacent fields in main crop plains, due to differences in individual farmers’ preference. Seasonal strengths of crop growth and development are strongly related to habitat environment where they are grown. Great variations of inter-annual changes in crop yield at broader spatial scales and among individual farmer-owned fields are therefore commonly recorded, partially due to the diverse field management practices. Lack of effective field management practices guided by agronomists and agricultural decision makers strongly restricts improvement of water and nitrogen use efficiency thereby realization of agricultural modernization and precision agriculture. The goal of monitoring of per-field (individual small land holdings) crop growth and development at landscape/region level to be realized, however, remains challenging partially due to the absence of adequate methodology. The methodology applies ecophysiological data, which are directly involved in crop growth, to broader spatial and temporal dimensions to explicitly quantify influences of environmental change on the per-field status of crop growth. To accomplish the goal, a spatially hierarchical integration (PIXel based CANopy photosynthesis model, PIXCAN) that fuses measurements from leaf to canopy and field scales was then developed (Fig. 2). 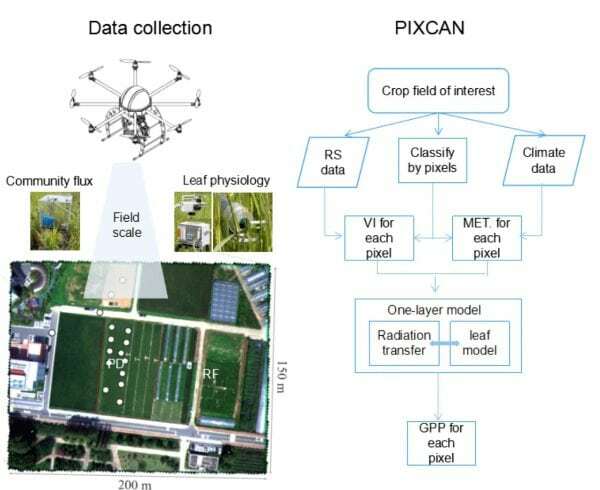 The PIXCAN model links UAV (unmanned aviation vehicle) remote sensing at a spatially high resolution and ground surface measurements of canopy structure and function. A UAV system was fabricated to be as light as possible, with eight propellers. It incorporated a gimbal on which a remote sensing camera was mounted. Acquisition of the UAV images at a spatial resolution around 10 cm was taken at approximately local noon ± 30 min at principle phenological stages. At the time of UAV application ground surface measurements of leaf photosynthetic physiology, leaf area index, and canopy structure were simultaneously carried out. Post-processed UAV remote sensing images were linked to the ground surface measurements, which were compiled in ENVI/IDL interface environment. 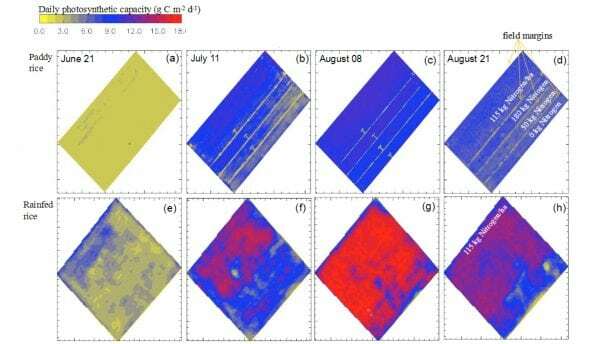 Development of the spatially hierarchical integration of UAV remote sensing and in vivo measurements of crop growth information steps forward to better monitoring of seasonal change profiles of per-field crop growth and development and understanding of mechanisms of how field water/nutrient management practices regulate inter-seasonal variations of per-field crop growth and development (Fig. 3-leaf area and FIg. 4-photosynthetic capacity). For example, spatial variations (SVs) in both photosynthetic rates and light use efficiency early in the growing season were amplified by nitrogen addition, and such nutritional effects dismissed over time. The occurrence of soil desiccation at some fields significantly compresses canopy photosynthetic capacity, which is also quantitatively detected by the crop information delivery system (CIDS). Timely application of irrigation and nutrient in field space could eliminate impacts of adverse environment on crop growth. Its extension version of the crop information delivery system under preparation that would integrate soil properties and crop growth submodel to track daily crop growth and biomass production would impose rare opportunity in better monitoring of changes in regional crop yield under global environmental changes. 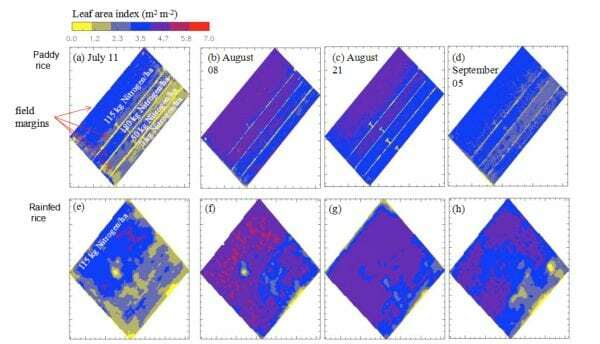 This study, A spatially hierarchical integration of close-range remote sensing, leaf structure and physiology assists in diagnosing spatiotemporal dimensions of field-scale ecosystem photosynthetic productivity, was recently published in the journal Agricultural and Forest Meteorology while working with Xinjiang Institute of Ecology and Geography, CAS.